Integrated Secure is solving customer business challenges through adoption of innovative technical solution. Your business requirements are continuously evolving, so should your technology systems. 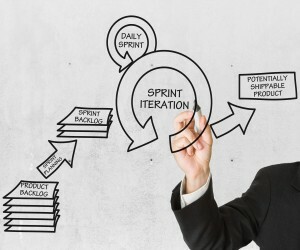 See how we ensure agility in our dev process. Our team of cloud architects and strategists can lead the process of moving data and applications from on-premise hosting to the cloud. Integrated Secure is an Information Technology Solutions Company focused on driving client value through technical thought leadership, design, and integration of innovative solutions. Focusing on client outcomes we strive to align IT initiatives with business goals. Integrated Secure provides full life-cycle solution delivery, from planning and design, through implementation, delivery, and ongoing support. Our clients include Fortune 500 corporations, Federal and local governments, and small and mid-cap business. Our teams of technologists excel in guiding clients through technical planning and discussions to ensure "best-fit" solutions are delivered on-time, on-budget and closely aligned with ever evolving business needs. Interested in learning more about how our team can assist you in achieving your goals? Let's chat.